Preferred Habitat: Fields and woodlands; suburbs and urban areas. Seasonal Occurrence: Very common April through October. Breeds in our area. Profile by Richard Gibbons: The Common Nighthawk is a medium-sized bird with long narrow wings. During flight it is easily identified by the stiff wing beats and white wing bars. Like most in the nightjar family the nighthawk sports colors of brown, white, gray, and black, which allows it to easily blend into its environment. Another prominent feature of this bird is it large head that is accompanied by its enormous eyes and small beak. 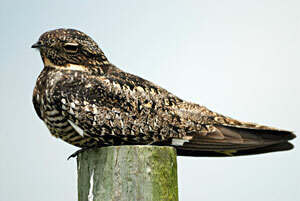 It is suggested that the Nighthawk received its name from its resemblance to smaller hawks while in flight; however, they are neither closely related to hawks, nor are they strictly nocturnal. They are crepuscular, which means they are most active before dusk and after dawn. They can be seen during the day perching on power lines or the ground. Locally, they are often found on fence posts at the Bolivar Flats Shorebird Sanctuary. Common Nighthawks nest on the ground at Bolivar Flats in open areas with some vegetation. An interesting behavior of the Common Nighthawk is the booming sound it produces during flight. During the breeding season, they will climb to considerable heights in preparation for their spectacular dive. They can come within feet of the ground before they pull out of their dive. The rapid course change creates the booming sound (some say it sounds like a flame thrower) by forcing air through their wings. Notes by Glenn Olsen: Our Common Nighthawk is in the Caprimulgidae family along with seven other North American species. This group of birds is commonly called goatsuckers, a name that comes from the erroneous folk tale that they feed by sucking on the teats of goats at night. Nightjar and nighthawk are additional terms used to distinguish birds in this family and respectively refer to subfamilies, Caprimulginae and Chordeilinae. Nightjars are the Common Pauraque, Common Poorwill, Buff-collared Nightjar, and the Chuck-will’s-widow. The nighthawks are the Common, Antillean and Lesser Nighthawks. The Common Nighthawk is the most widespread species of this family and breeds throughout most of the US and Canada. It is the only species that has been documented to "regularly" breed in our immediate area. It nests on open ground like short grass fields, bare ground, sandy areas, gravel or rocky beds, and even flat roof tops. They do not construct nests but may use a shallow depression or simply bare ground. Common Nighthawks feed on insects while in flight, typically beginning at dusk (crepuscular) but may also be observed feeding any time of day on cloudy, overcast days, at night (nocturnal) around soccer/baseball stadiums lights, or other large lights that attract insects. It is usually easy to locate these birds in the urban and suburban areas of Houston by simply going outside and looking skyward a little before dark. In flight silhouette, the Common Nighthawk appears a little similar to a falcon, but the flight pattern is more erratic as it feeds on insects. The bird appears generally gray or dark but has white bars near the tips of the wings. In our area during migration it is possible to see Chuck-will’s-widow, Whip-poor-will, Common Nighthawk, and rarely the Lesser Nighthawk. The Chuck-will’s-widow and Whip-poor-will begin arriving in our area in mid-March and the Common Nighthawk around mid-April. You can learn about and enjoy nighthawks and nightjars while adding to the database of information for these species by participating in the Nightjar Survey Network.